England manage to take the game to day 5 here, Kohli has a wry smile on his face. India will come back tomorrow for that one wicket. 93 overs bowled in the day and India pick 9 wickets, Buttler and Stokes managed to keep India at bay for the day atleast. Do join us tomorrow for all the live action! WICKET! Broad departs finally, Bumrah picks a five-for finally. Gets the ball to move away and take the outside edge, straight through to Rahul at second slip. Broad departs for 20 and England are 291/9 now. STAT ATTACK: For the first time in the history of Test cricket, two players from the same side - Rishabh Pant & KL Rahul - have taken six catches each in a match. WICKET! Bumrah strikes again, this is what happens, you get one, you get two! Bairstow departs first ball as the ball comes back in and pegs back England wicket-keeper's off stump. Bumrah will be on a hat-trick here, England are 231/6! 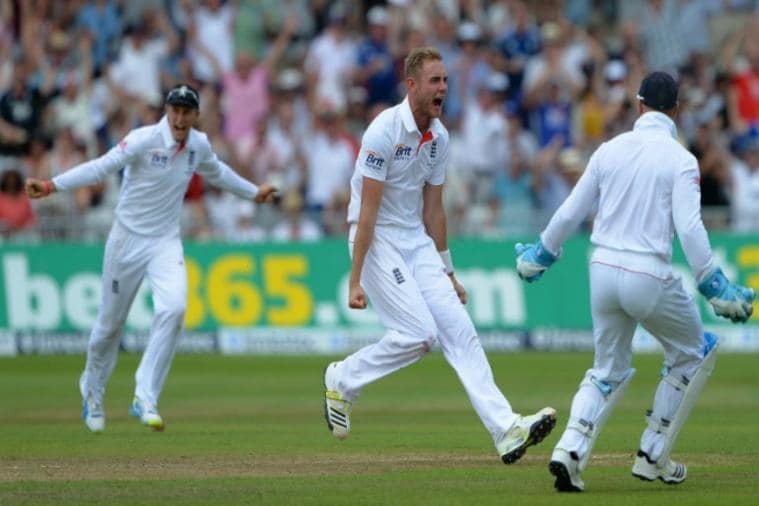 England fast bowler Stuart Broad has been fined 15 per cent of his match fee for breaching Level 1 of the ICC Code of Conduct during the second day of the third Test against India at Trent Bridge. KL Rahul has taken 7 catches in this Test, which is the most by a fielder in a Test in ENG. Anderson and Rashid survive yet another over here, if they survive three more then we will have to come back tomorrow for the fifth and final day. Will India seal the victory today? Bumrah gets his 2nd five-for in Tests. Mohammed Shami comes into the attack now as India look to wrap up the tale here, just two wickets away from what would be a special victory at Trent Bridge here! Stuart Broad is the new man in here, he can expect a lot of chatter here, considering the sent off he gave to Pant. Can India seal a special victory here? The partnership between Buttler and Stokes is worth 168 runs now, its the highest fourth wicket partnership for England ever, beating Trevor Bailey and W Watson, who had put up 163 runs against Australia at Lord's in 1953! Probing over from Bumrah with the new ball here, already more questions asked than India did in the previous hour. This will surely be a testing time for the English batsmen now! India will be hoping that the new ball does the trick for them here, it will be due soon and looks like the only hope for them to break this partnership! J Buttler scores his maiden Test ton. This is the 6th Test ton in the 4th innings of a Test a Nottingham. FOUR. On the pads and Buttler hits it away towards the fine leg boundary. Fine shot that and he picks up four, moves to 95 now! Follows that up with a fine pull shot towards backward square leg to move to 99. England are 216/4! Live Updates: England manage to take the game to day 5 here, Kohli has a wry smile on his face. India will come back tomorrow for that one wicket. 93 overs bowled in the day and India pick 9 wickets, Buttler and Stokes managed to keep India at bay for the day atleast. Do join us tomorrow for all the live action! The live telecast of the fourth day will start at 3.30PM. The match can be seen live on the Sony Six network and live streaming will be available on SonyLIV.com. You can also follow our live blog for ball-by-ball updates and analysis on cricketnext.com. Courtesy Kohli's 103, his second ton of the series, India declared their second innings at 352 for seven, leaving the hosts an improbable victory target of 521 runs. Kohli's runs came off 197 balls and was studded with 10 boundaries. He shared 113 runs for the third wicket with Cheteshwar Pujara (72), who also returned to form after a dismal outing in the second Test. Hardik Pandya also made an useful contribution after his maiden five-wicket haul, smashing a run-a-ball 52 with the help of seven boundaries and a hit over the fence. Kohli seemed in no mood to drag the innings any further and decided to declare the innings, handing his bowlers nine overs to go full throttle. But Alastair Cook (9 not out) and Keaton Jennings (13 not out) played cautiously to fend off the nine overs with England still needing another 498 runs for win with two full days of play remaining. Earlier coming onto bat after tea, Kohli got a life on 93 when Jennings missed a catch at gully off James Anderson (1/55) in the 91st over. Soon after, the Indian skipper celebrated his hundred off 191 balls. But Kohli failed to capitalise on the chance as he was trapped lbw by Chris Woakes (1/49) soon. It triggered preparations for declaration in the Indian camp as Rishabh Pant (1) walked out to bat at number six. He tried to attack but only edged to give a catch at slip off Anderson. Ajinkya Rahane (29) and Pandya then put on 47 runs for the sixth wicket, before Adil Rashid (3/101) bowled the former. India's lead crossed 500 with Mohammed Shami (3) being the last man to be dismissed before Kohli declared the innings. After lunch, Kohli continued his sedate partnership with Pujara as the duo went about their business in style. The pair looked in no hurry as they continued grinding the English bowling attack. India crossed 200 in the 63rd over with Kohli and Pujara bringing up their 100-run partnership off 270 balls. Kohli also crossed the 400-run mark in this series, becoming only the second Indian captain after Mohammad Azharuddin (426) to do so against England. Overall, he is the sixth Indian batsman to achieve this feat. Things were moving along nicely when Pujara edged a Stokes' delivery to Cook at first slip against the run of play. Pujara faced 208 balls and struck nine fours.